My friend, Chris, sent me this link. How many cans of diet Pepsi at one time would it take to kill me? If I drank Diet Coke it would only take 333.67. I guess I will stick with the Pepsi. I am feeling kind of good about this 417 (almost 418) can limit. I have been doing some calculations. I've been adding up the number of cans I drink a day. I figure I can safely drink another 50 cans a day before the caffeine kills me. So, I am well within the safety limit. Guess that means I will be going before you. Will you sing at my memorial? Just want you to know that when I tell my kids (who are 19 and 17) that I have spoken to Kathy, they say, "Diet Pepsi Kathy". That means that the Diet Pepsi company has one loyal customer - at least 19 years strong! That deserves some kind of prize...maybe a few shares in the company or a lifetime supply. Especially because according to this website, you are one healthy Diet Pepsi drinker!!!! 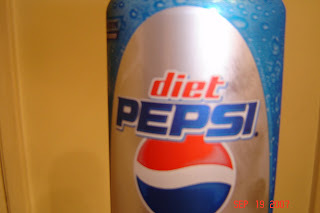 Yes, I have been a loyal diet pepsi drinker for many, many years, However, there was that brief period of time in college when I drank quite a few cherry diet cokes at Nagles. But, I think I did that mostly to socialize. That was back when I was just a "social" drinker. Now, I'm a full fledged addict.